Kohlrabi seemingly is not much grown in this country, despite a Continental popularity. One of the hindering factors appears to be the urgent need—with most varieties—to make sure and pick it when still quite small, maybe 2 inches’ diameter maximum, lest it get quite unpleasantly woody and even bitter. A great vegetable might justify the need for such prissy attention, but we suspect that its best friends wouldn’t call kohlrabi a great vegetable. Mind, if kohlrabi is not a “great” vegetable, it is still an awfully good one. It seems to command little respect in the literature, but we think it the second-best of all the numerous Brassicas, behind only well-grown broccoli. Though some describe it as somewhat pungent (as most Brassicas are), we found it—at least the cultivar we grew—to be rather mild: in fact, a great way to get the characteristic Brassica taste with no sting or bitterness (unlike, say, a turnip). Fortunately there is a variety of kohlrabi that can, and does, achieve great size without losing any quality; that, obviously, is the type we trialled and now stick with. It is most commonly called Gigante, but is also known as Superschmeltz (seed sold as Brukev might be the same cultivar). The ones we grew got substantially bigger than a softball, yet were pleasantly mild, sweet, and good-textured. (It is said that ten-pound, bowling-ball-sized specimens are not rare.) We suspect that those who report kohlrabi to be pungent have been dealing with oversize non-Gigante specimens (about all you’ll get in retail groceries and supermarkets), since few commercial farmers will pick at 2" a vegetable that can be grown to 4" or 5"; that’s another reason why the Gigante cultivar is so great. This is a seriously under-valued and under-used vegetable; it can (and for us and, it seems, many others) utterly displace turnips and rutabagas, but that’s somewhat left-handed praise that fails to do it proper justice. Most or all commercial kohlrabi is direct-seeded, and there’s no reason not to follow suit in the home garden. Mature kohlrabi withstand even severe frosts—indeed, the plant can be left in the ground right through winter—but young plants may bolt if they see, say, a week of temperatures at or below 50°F. (daily highs, that is). Once started, kohlrabi is said to grow best at a temperature between 65° and 75° F. Typical growth times are 7 to 8 weeks, but the Superschmeltz/Gigante cultivar can go as long as 4 months or more in reaching its full development (one northern seedsman actually says 130 days, though another source says “only” 80 days). If we do our reckoning by examining the earliest time we could plant, the concern is to not be so early that the seedlings might see cool daytime temperatures and bolt. Daily highs hereabouts do not—as always, on average—rise above 50° till about mid-March; even being extra-cautious, then, planting around April 1st should be fine. Even the Superschmeltz/Gigante cultivar, were it planted at that time, would be ready by no later than early to at latest middle August. But that raises a problem: Kohlrabi, like many “roots” (though it is not, technically, a “root” crop—the bulb is an enlarged stem), becomes somewhat better-tasting after at least one light frost; and we don’t get frosts in August. So it seems we need to go about it the other way round: determine what’s the latest we want to harvest, then work back to a planting date. In fact, we aren’t too fussy about an end date, owing to kohlrabi’s cold-hardiness once well established. On average, even night-time lows don’t hit freezing till around November 1st, and the ground comes later yet. Did we take the end of October as our nominal target—to assure the bulbs seeing some frosts, which reportedly improve flavor (that is said of almost all root crops)—and work back the 130 days of this cultivar’s growth, we would get June 22nd as a planting date. But then the young plants would be exposed to our highest temperatures, and kohlrabi, like all Brassicas, prefers it cooler. Since we don’t too much care about the end date, it is better to move down-calendar, perhaps to August 1st, for a planting date, with an expected harvest date somewhere in early December (giving us those wanted frost exposures.) The only real endpoint is when the soil freezes such that digging the ball out is difficult. Sow seed ¼ to ½ inch deep. Jeavons recommends a 4-inch spacing, but he obviously wasn’t dealing with Superschmeltz. We would say 6 inches absolute minimum, and more if your space allows it, up to 10 or even 12 inches, to accomodate the large size they can attain. Kohlrabi likes much the same conditions as all cole crops: it’s fairly indifferent to soil type and pH, but does like well-drained soil; some sources say they prefer a slightly alkaline soil, a hair over 7.0. They are also said to prefer a “heavy” soil, so—within reasonable bounds—clay is not a problem. But unlike most coles, Kohlrabi is said to like a little shade when growing (in a deep bed, the plant spacing will cause the leaves to act as a shade canopy over the plants—the proverbial “living mulch” effect—so that’s OK). They are heavy feeders, and want well-fertilized soil. Established plants are drought-tolerant, but the best stems are formed when the plant does not go short of moisture. You actually can harvest as early as you like, but with the Superschmeltz type (which doesn’t go all coarse and woody with size) you can, in the fall, just let it go and go till it gets as big as it will, then—because they are so frost-hardy—leave it there till you’re ready for it. (Though the ground might freeze, making harvest more difficult—but the kohlrabi, the part we want being really a swollen stem, is actually almost entirely above ground.) We, in our then-ignorance, once planted them way too early—around June 1st, and they got hit by The Great Freeze that year—but we still got magnificent specimens from all our plants. This is one generous vegetable. Kohlrabi’s name (think “cole”, as in “cole slaw”, and “raab” as in “broccoli raab”) tells its tale: it’s another of the productive, tasty, and nutritious members of the Cruciferae family, the crucifers. Unlike most of them, however, it is grown for its swollen stem (though often called one, it is not a “root” vegetable). Kohlrabi’s true origin is unclear, but it was already known by the 1st century A.D., for Pliny the Elder mentions a “Corinthian turnip”, which—from its described growing habits—is almost certainly kohlrabi. Apicius, who wrote the oldest known cookbook on cooking and dining in imperial Rome, also mentions the vegetable in his recipes. Charlemagne, Emperor of the Holy Roman Empire from 800 A.D., ordered kohlrabi grown in all the lands under his reign; one thinks of Charlemagne as French, but his city of residence, then called Aix-la-Chapelle, is now Aachen, which is in the Western portion of Germany—hence kohlrabi’s German name, which means “cabbage turnip” (Charlemagne was better known in his time as Karl des Grosses). 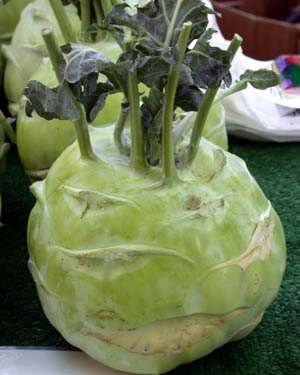 Kohlrabi found its way into Northern India in the 1600s, where it soon became a dietary staple. More recently, kohlrabi has become an established vegetable in China and Africa. In America, the vegetable remains sadly neglected; only in the South does it enjoy even a modicum of popularity. Now that the town of Kohlrabi, California no longer exists, you might want to look in at this page about The Order of the Kohlrabi. It was last modified on Wednesday, 30 January 2019, at 05:57 EST.